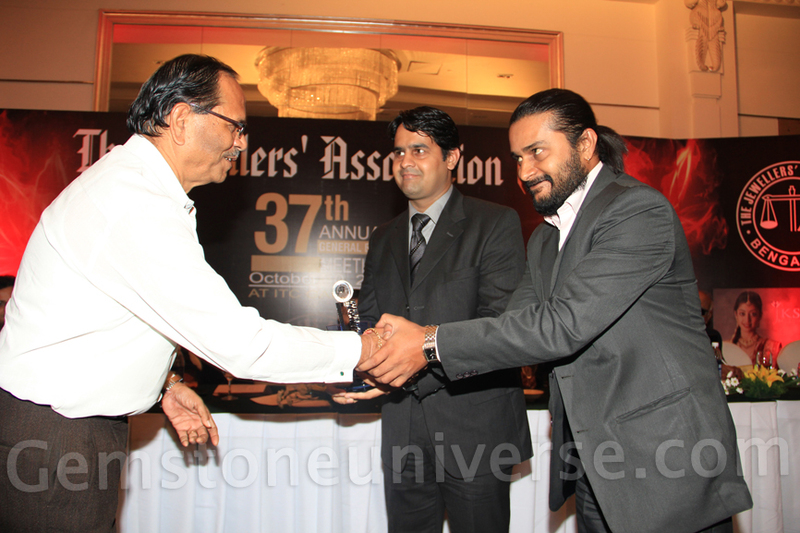 Gemstoneuniverse gains recognition for Excellence in Exports 2nd year in a Row! It is easy to be successful. You only need to know the right keys to unlocking the doors of fortune. However, it is sustaining the success which is the real art to be mastered. We are proud to announce that Gemstoneuniverse has won the Export Excellence Award from Karnataka, for the second year in a row! 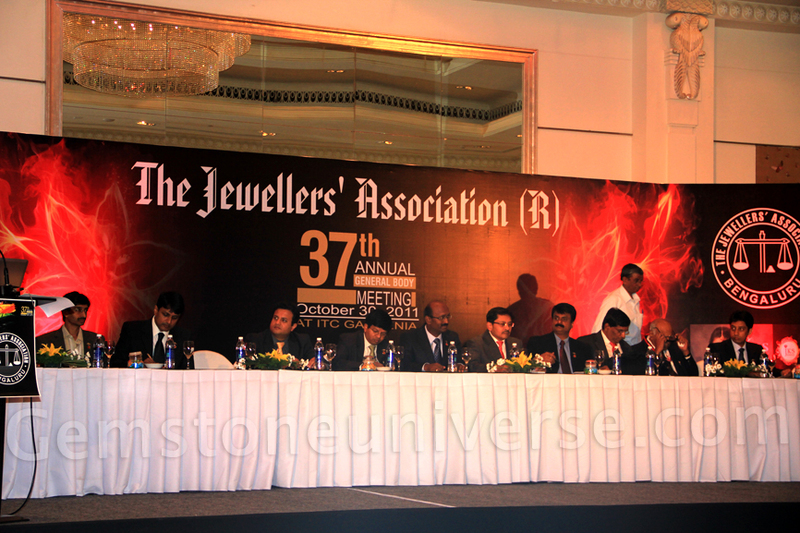 The award was given on October 30th, 2011 at the 37th annual general body meeting of the Jewellers Association held at ITC Royal Gardenia-Bangalore. The award comes in recognition for commitment to service, exceptional products, high quality and ethical standards apart from just reaching significant volumes. 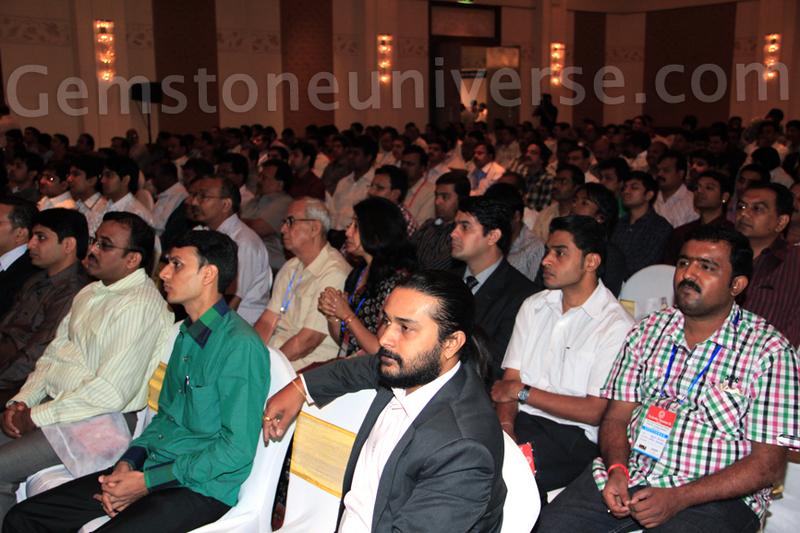 Gemstoneuniverse has diverse clientele spread worldwide and is committed to the cause of Planetary Gem Therapy. The award also acknowledges the exceptional product quality, world class certification and transparency in the complete Gemstoneuniverse process. From the time a patron inquires to the product delivery, we try to ensure that it is an exceptional and cherished experience. Our approach and our commitment is what really sets us apart and we wish to make it better all the time. What is special and unique about this award is that we just specialize in what we are best at and that is Jyotish Quality Natural Gemstones. We believe that all of you are as deserving of the joy – we thank you for your support. We are committed to the cause of Planetary Gemology and will ensure that you shall have a flawless experience with Gemstoneuniverse in all areas just like flawless Jyotish Gemstones. We won the award last year also. Details can be accessed here. 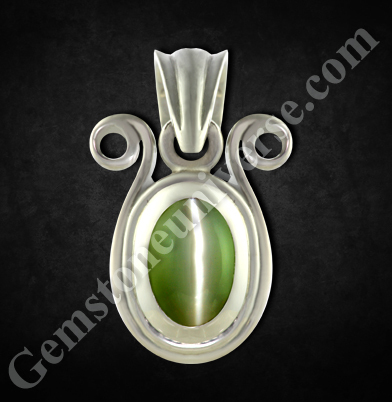 A Cat’s eye Chrysoberyl, Ketu Talisman that provides the power to explore what lies beyond and more! 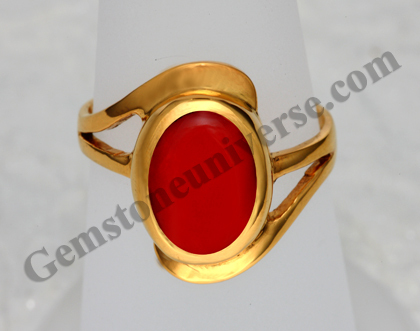 Cat’s Eye also known as Lehsunia and Vaiduryam is a very powerful gemstone. In fact it is equally powerful in its effects as a Blue Sapphire. This is an example of a Kanak Khet Cat’s Eye or Golden Green Color cat’s Eye. Among many other benefits Cat’s Eye brings back Nasht Lakshmi-Lost wealth. Powerful people the word over keep cat’s Eye in their vault. It is a gemstone of adventure and unexpected results. It is this precise reason that it is a favourite Gemstone for Gamblers and those involved in speculative fields! It is also the favourite gem of individuals involved in high risk activities. Comments Cat’s Eye also known as Lehsunia and Vaiduryam is a very powerful gemstone. In fact it is equally powerful in its effects as a Blue Sapphire. This is an example of a Kanak Khet Cat’s Eye or Golden Green color cat’s Eye.Among many other benefits Cat’s Eye brings back Nasht Lakshmi-Lost wealth. Come and View the richness and power of this Ketu Talisman. Magnificent all natural Cat’s eye Chrysoberyl with a Golden Green Hue. At 3.85 carats this one just beams with powerful energy. Energy which is out of the box, different, powerful and adventuresome that provides the courage to explore beyond the tried and tested to unravel what lies Beyond- this is the power that Ketu gives and this is exactly the power of a Jyotish Quality Cat’s Eye. This X Factor makes choosing a Jyotish Gem a special art known to only a few. Comments Lovely Colombian emerald with fresh grass green color and good clarity that allows maximum movement of light. Symmetrical Emerald Cut, Rich Color, Good clarity, above 2 carat weight and lack of treatment render this emerald as a very powerful Jyotish Gem. 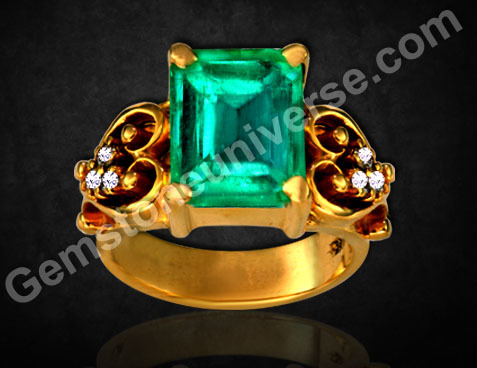 Set in a Vintage era ornate ring the rich Gold of the ring shank complements the richness of the Emerald Color. 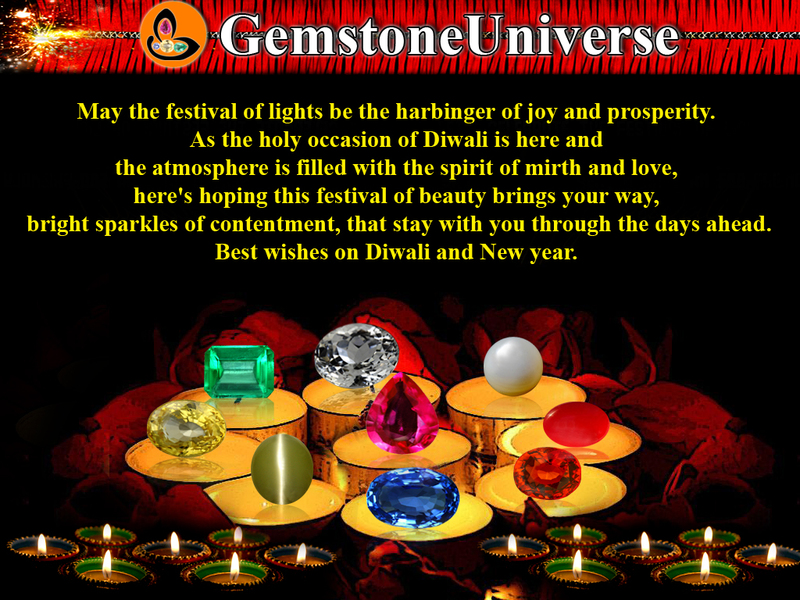 Team Gemstoneuniverse wishes you all a Gem-dazzling and Be-Dazzling Diwali with the Sacred Nine Gems of the Nine Planets. May you and your loved ones be blessed with health, wealth and success. Energy, strength, vitality and courage the essential attribute of Mars the commander of the army of the Gods in this Red Coral ring in Gold. Comments Classic Mars Talisman. Deep Mediterranean Ox Blood Red coral from the Japan Sea set in an elegant 22 KDM Gold ring. The contrast is the feature of this ring. Rich Gold contrasts with luxurious Gold. Organic Certification and the origin mention add value. Red Coral is the Gemstone of Mars and besides its extensive use in Jyotisha finds much value in Ayurveda, where it is used in several Ayurvedic medicines. Praval/Prawal ( Another name for the Red Coral) Pishti a paste made from Red Coral is used for many herbal rejuvenative medicines. It is good for the intestine and the kidneys. Comments An unheated Blue Sapphire touching nearly 4 carats with the famed royal Blue Color. The lovely cut and the dimensions add to the allure of this mystical and ornate beauty. 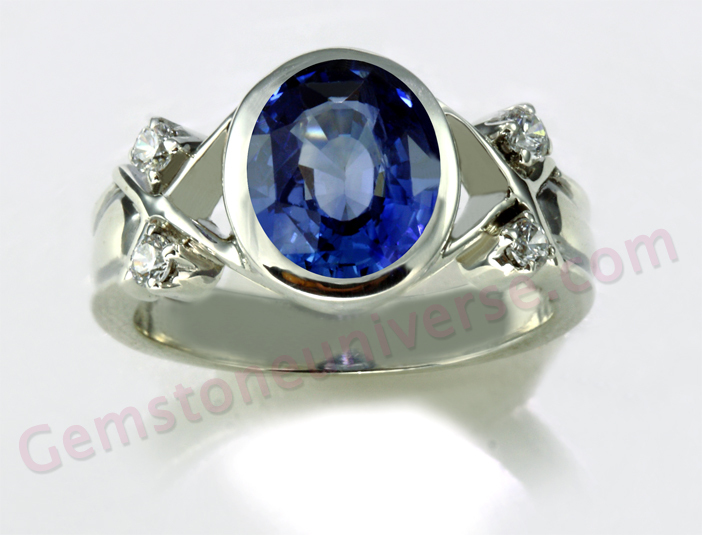 When choosing a Jyotish Gemstone one has to be the most careful in choosing the Blue Sapphire. It has to be absolutely free from any of the flaws specified in the sacred texts. What you see here is an absolutely flawless blue sapphire- A Sapphire that is capable of those legendary and mythical results which only the Blue Sapphires are capable of. Comments Jupiter is the planet of good luck and fortune and Jupiter is also the planet of divine knowledge, orthodox implementation of rituals, high on morality besides being the planet of truth and sacred knowledge. 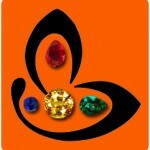 The same attributes should be present in its gem to be of use in Planetary gem Therapy. 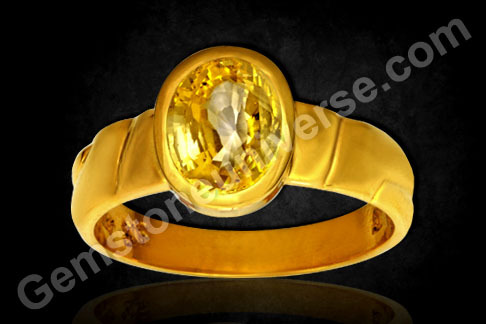 Featured here is an unheated Ceylon Yellow sapphire. The single outstanding factor is the Golden canary Yellow Color that is the most sought after color for Jupiter benefits as described in the shastras (sacred texts). This color with no heat exists only in a few Gems and those are the Jyotish gems capable of creating wonders. Match that with the fantastic clarity levels and the scintillation within and you have a destiny altering birthstone ring. A Yellow Sapphire representing the best of Jupiter attributes. Victory comes by Able Guidance and Divine Blessings- Personalized Pendant having Ruby and Yellow Sapphire representing the Ruler & His Preceptor. The Sun powers get fortified further with the addition of an unheated yellow Sapphire. Virtually inclusions free and full of the desired color these two gemstones are creating an electric chemistry in this Yin Yang energy concept pendant. Vedic texts are abundant with instances of the importance of a true Guru- an able preceptor who is vital to an individual’s material, spiritual and emotional progress. This happens in the material world as well in the divine world. Sun is the ruler of the planets. Sun represents self esteem, victory and administration and Jupiter also known as Dev Guru ( The Teacher of the Gods) is the divine preceptor. There is nothing that cannot be achieved when an Able and a courageous ruler is counselled by the right authority. 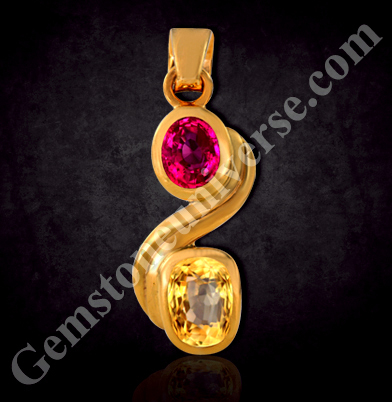 Featured here is a personalized Vedic Birthstone Pendant and an fantastic implementation of Gem Therapy. Both Sun and Jupiter were playing a key role in the patron’s horoscope and this combination is a fantastic combination. The choice of the gemstones is awesome. With Flawless clarity and wonderful color these represent the powers of the Royal Sun and the blessings of Jupiter. Due to the nature of the work the patron is involved in he opted to get both his gemstones set in one single pendant and this pendant touches his heart chakra. What results will follow- one can only imagine? Comments A Classic and elegant 4 C beauty. 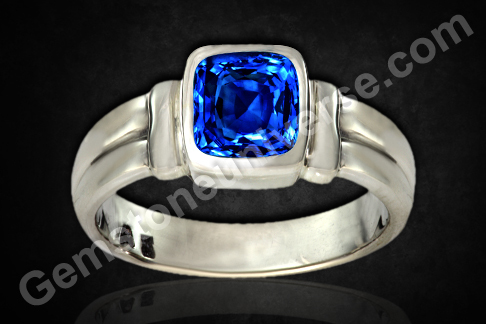 An unheated Blue Sapphire from Ceylon that is very close to the Kashmir Blue Sapphire color. Super Lustrous, strong color, intense for superior Shani powers as per Vedic Astrology.Blue Sapphire is the Gemstone of Saturn and among all planetary rings and pendants it is the Blue Sapphire rings that evoke the maximum awe. When choosing a Jyotish Gem it is vital to ensure that not only the Gem excels on parameters such as cut, color, clarity and carat weight but also that it is treatment free and most importantly it is free from any doshas( flaws that cause bad results and afflictions) as mentioned in the sacred texts. It is this knowledge that makes planetary gem therapy special and exceptional and it is this criteria that makes a Gem eligible to be classified as a Saatvik Gem a Vedic Gem. 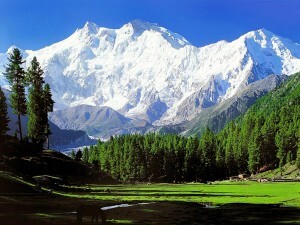 Pure, Pristine and an agent of positive change. What makes a Gemstone- A Gemstone? It is its inherent beauty, the richness of color, the scintillation provided by a perfect cut, the novelty of its origin and most significantly its rarity and the difficulty in getting such a wonder that is fit to be called a Gem. Presenting our new lot of Natural Peridots aptly called as Himalayan Glory an adjective used to describe something special of Himalayan Proportions. Mined in the Suppatt Region in Pakistan at a height above 11,000 feet these Peridots are a fine example of quest of Man to get a Gemstone- a real Gemstone that delights and surprises. Located in the highlands above the Indus River Valley it takes a 7-8 hour horseback ride before embarking on a strenuous and a dangerous trip that lasts 2-3 days before reaching the mining area-a region whose beauty no words can describe. 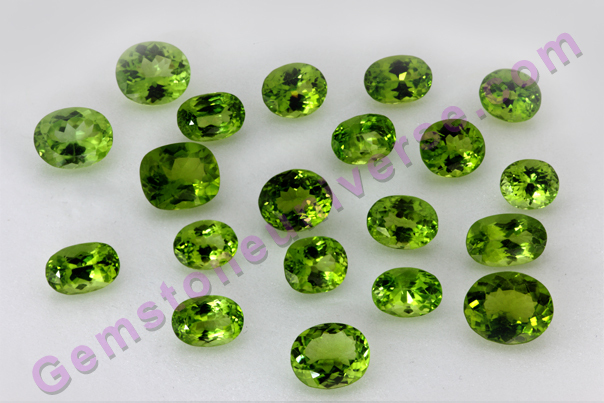 These fine Peridots represent the fundamental values that drive Gemstoneuniverse. Have a look at these beauties in their full splendour and appreciate the miracles of Nature. Peridot often referred to as the Evening Emerald is the superior alternative, uparatana to be used as a Mercury Gemstone in lieu of an emerald. With color and clarity like this you can expect some wonderful results in your Gem Therapy. – Finest Golden Olivine Green Color with sensational lustre. – Rarity of its origin gives it a special draw. – Clarity levels above 95% for the best planetary results. – Fine symmetrical cut that enhances the beauty. – Fully Natural, Treatment Free, free from any doshas ( flaws) as mentioned in the sacred texts- a true Jyotish Gem. – Each Singular Peridot of this lot will find itself at the apex of the Gemstone Pyramid. Certification and Appraisal of this lot is complete and you shall have it in the online Peridot Inventory in the next 48 hours. You can access the Peridot Inventory by clicking here.